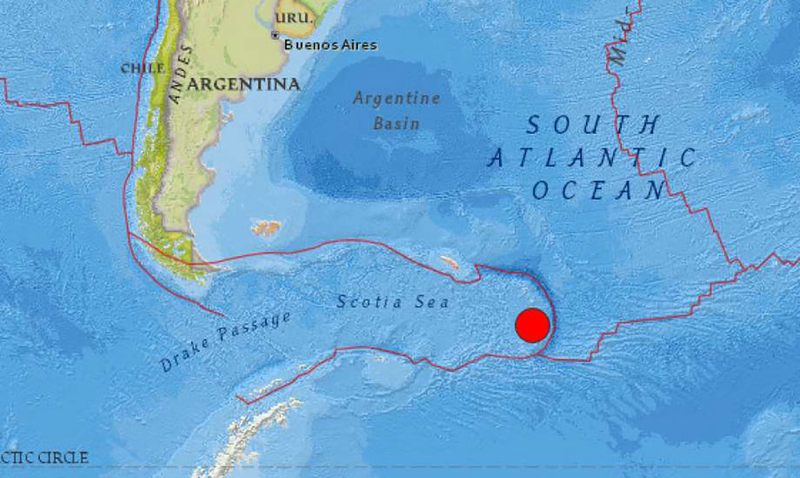 The U.S. Geological Survey (USGS) has reported that a powerful earthquake struck yesterday just north of Antarctica, close to the South Sandwich Islands at approximately 9:25 PM ET. The massive quake is the first reported in the area since 2016. Originally recorded at a magnitude of 7.5, it has since been downgraded slightly to a 7.1 on the Richter scale. Classified as a ‘major earthquake with the potential to cause serious damage’, it is estimated that only 20 earthquakes with that degree of force will strike in any given year. An earthquake of this magnitude has the power to cause significant damage to a populated area, with the potential to trigger either a partial or complete building collapse in its close vicinity. Luckily, this specific quake was recorded in an incredibly remote area minimizing the risk of damage. Estimated to have originated at a depth of approximately 102 miles (165 km), just 30 miles north of Bristol Island, it had the potential to be felt across the Argentine territory of Tierra del Fuego as well as mainland Chile. However, early reports reveal that there is no significant damage to report. The depth of the earthquake is said to have played an important role in the minimal damage and impact that was felt by those in the area. “Earthquakes such as this event, with focal depths between 70 and 300 km, are commonly termed ‘intermediate-depth’ earthquakes,” the USGS explains on their website. “They typically cause less damage on the ground surface above than is the case with similar magnitude shallow-focus earthquakes, but large intermediate-depth earthquakes may be felt at great distance from their epicenters,” Last night’s earthquake is said to have been felt within a 155-mile (250 km) radius of its origin. Bristol Island itself is considered to be a highly volcanic area, meaning that it is no stranger to the power of natural disasters. The best-known volcano on the island, Havfruen Peak, reaches an incredible 1198 feet (365 m) in height, while further west Turmoil Point stands 1312 feet (400 m) tall. At this time there are no reports that any volcanic activity has been triggered or influenced by the impact of the quake. Furthermore, the U.S. Pacific Tsunami Warning Center has confirmed that there is no expected tsunami threat from the event. This is the second major earthquake to have hit recently, with a magnitude 7.5 earthquake recorded on December 5th at 4:18 AM UTC in the southern Pacific Ocean near New Caledonia. While evacuation orders were put in place for coastal zones considered to be at risk, no major damage was reported immediately following the quake.